This Tuscan Poppy Landscape tapestry shows a marvelous rendition of poppy fields of the Mediterranean. In this scene we see a stylised rendition of the poppies in full bloom, on curved rolling hills accented by its rows of vineyards and crops, all the way to the horizon. The quaint and cute villas can be also seen in the scene as well as the tall poplar trees so characteristic of the wonderful Tuscan landscape. 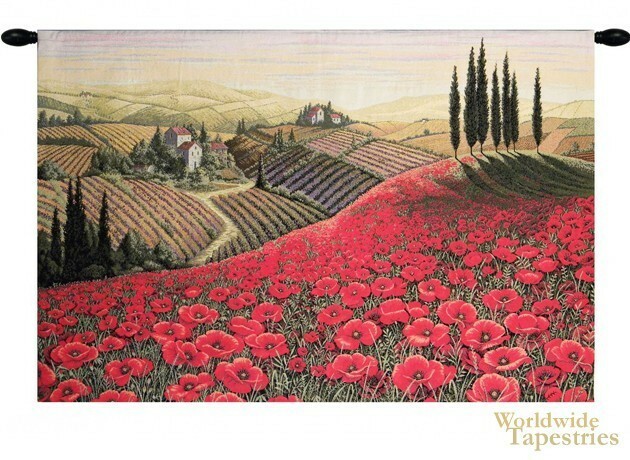 This Tuscan Poppy Landscape tapestry is backed with a lining and a tunnel for easy hanging. Note: tapestry rods and tassels, where pictured, are not included in the price. Dimensions: W 53" x H 34"